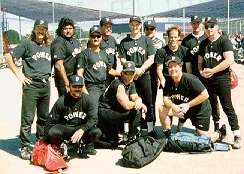 The picture below is Power from Houston, Texas while competing in ASA 'B' Nationals in Shreveport, LA, 1995. Took 2nd place to BFI in the regional qualifier at Homerun Country Club in Houston, TX, then went on to sweep the regionals in Wichita Falls over the likes of DSC, Standard Construction, Temple Smurfs, Athens Outlaws, and others. Did not fare so well in Nationals, bowing out early at 2-2.